Texas is the third largest producer in the U.S., harvesting 3.4 million acres annually. The cash value to farmers is $288 million, generating $973 million for the economy. Texas’ hard red winter wheat land is commonly fallowed or rotated with other crops. 74% of irrigated wheat is scouted and sprayed. Dryland production receives fewer inputs and is less economical to spray for insects. Greenbugs and Russian wheat aphid are the primary pests. Other pests include mites, fall armyworms, and cutworms. Chlorpyrifos (Lorsban), dimethoate (Cygon ) and methyl parathion are three OP insecticides and targeted by FQPA that, if withdrawn, could cause yield losses of 8 to 10%. Lorsban is primarily used for greenbug control. 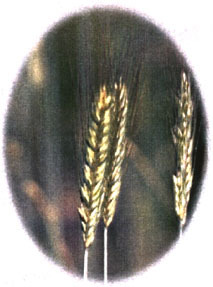 Wheat is bred with genetic resistance to most fungal diseases. Disease resistant varieties are the most effective means of disease control. Principle diseases are rusts, powdery mildew, septoria leaf blotch, and viruses in some areas. Fungicides are available to protect against leaf rust and stem rust but are not cost-effective in most dryland fields. Propiconazole (Tilt) is used on 2% of the acreage, mostly for leaf rust. Crop rotations, fallow and soil tillage are widely practiced as a form of integrated weed management. Common weed problems include field bindweed, and other perennial weeds, such as annual grasses, such as ryegrass and rescue grass, and winter annual broadleaf weeds, such as mustards. 25% of acreage is treated with herbicides. 2,4-D is the most common, followed by metsulfuron (Ally), dicamba (Banvel) and chlorsulfuron (Glean). All of these herbicides are essential for economic wheat production. Irrigated and dryland wheat will continue as a major crop in Texas for food use and winter pasture. Breeding and non-chemical practices will continue but pesticides are essential to sustain production. Conservation tillage is widely practiced but perennial weeds are difficult to suppress. Crop Briefs is an information series developed by Texas A&M AgriLife of the Texas A&M University System on critical pest problems and pesticide needs for Texas agriculture. This effort is supported by the Texas Wheat Producers Board, and other commodity groups. Dr. Dudley Smith, Texas Agricultural Experiment Station and Dr. Juan Anciso, Texas AgriLife Extension Service prepared these reports August 2000 using information from numerous sources. Departmental Report SCS-2000-01.The information given herein is for educational programs only. Reference to commercial products or trade names is made with the understanding no discrimination is intended and no endorsement by the Texas AgriLife Extension Service and the Texas Agricultural Experiment Station is implied.